Just to the southwest is the Platte River, whose valley was one of the great roadways to the west, used by fur traders, emigrants, military expeditions, gold seekers, and Mormons. Mormon migration to the Salt Lake Valley began at Winter Quarters, present-day Florence, in the spring of 1847. The Mormons crossed Big and Little Papillion creeks and the Elkhorn River, then continued along the north side of the Platte River to Fort Laramie in Wyoming. This route from the Missouri River, often referred to as the "Mormon Trail," and later known as the "Council Bluffs Road," follows present-day State Highway 36. It is estimated some 165,000 travelers used the route before the transcontinental railroad was finished in 1869. The Platte River appears on maps of North America dating to the eighteenth century. It is designated by different names including "Panis" based on the name Pawnee, "La Platte" ("The Flat") as referred to by French fur traders, and "Nebraska River," an Indian term meaning "flat water." 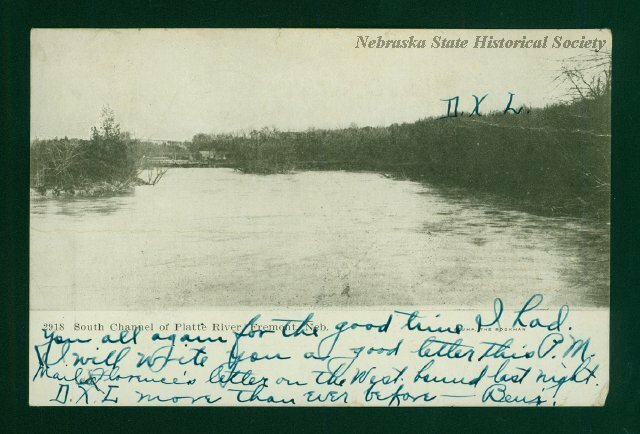 “Platte River History,” Explore Nebraska History, accessed April 18, 2019, https://mynehistory.com/items/show/188.